I am calling this colorful dish confetti, because it’s not quite assertively flavored enough to call it furikake . It is sort of a no-sugar (low-carb) and much lower calorie variation of Cooked to Death Hot and Sweet Peppers , though I have made the hot peppers optional. Even with no added sugar or sweetener, I think the natural sweetness of the vegetables comes through nicely. 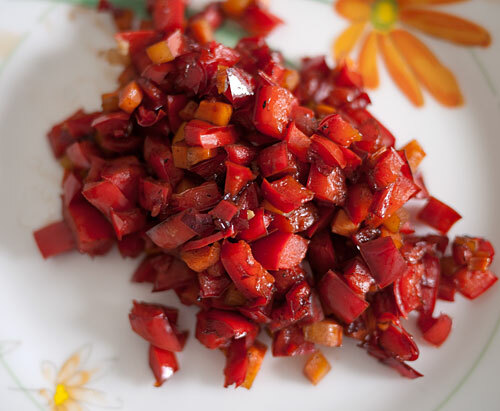 It’s a really useful vegetable side dish, to just pack on the side or sprinkle on top of rice or other things. You could also fold in a spoonful into tamagoyaki  to make it really colorful. It can be kept in the refrigerator for a few days, or frozen. I don’t know why (though it may be because there have been more and more new readers coming to the site), but these past couple of weeks I’ve been hearing complaints from people saying that my recipes are too “lightly flavored” or too “strongly flavored”. (To make it even more confusing, they’re split just about 50-50.) For example, a recent mostly positive review of my book  that appeared in the Sunday edition of the Straits Times in Singapore says that the recipes are ‘too lightly flavored’, while a recent comment to my Tuna Soboro with Ginger recipe  wails that it’s a horrible recipe because it’s “too strongly flavored”. Besides tearing out my hair, I can just assume that they have problems with the salt content. And yes, I’ve heard people saying that something is too salty or not salty enough too.